Senate Hearing On Drug Prices Reprises Past Inquiries : Shots - Health News A Senate hearing on Tuesday featuring pharmaceutical executives will tackle many issues raised in the historic Kefauver hearings, which led to tougher drug regulation. High prices remain a concern. 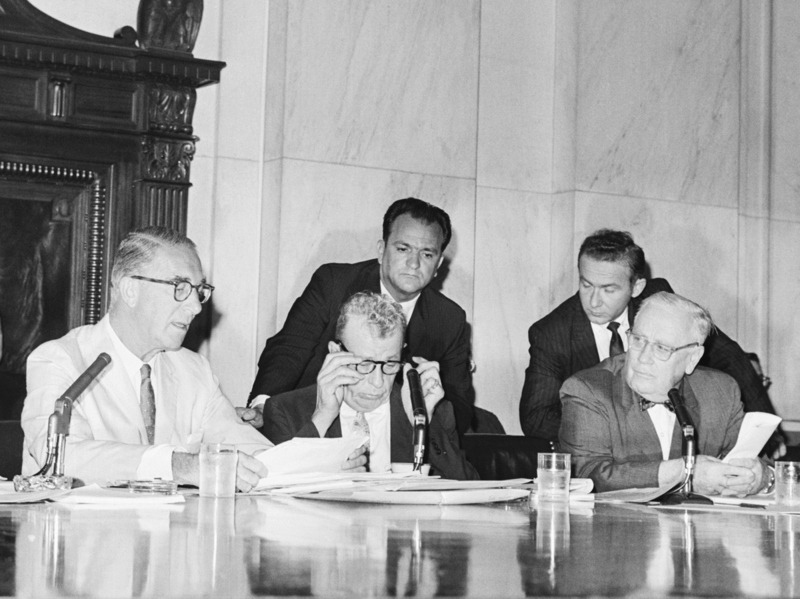 Sen. Estes Kefauver, D-Tenn., (left) and Sen. Everett Dirksen, R-Ill., (second from left) clashed at the reopening of a Senate drug investigation in 1960 over whether witnesses could be forced to reveal business secrets while testifying. On Tuesday, Kenneth Frazier, CEO of pharmaceutical giant Merck, is set to face senators who say drug costs are "sky-high" and "out of control." But Frazier doesn't need new talking points. Sixty years ago, a different panel of senators grilled a different Merck boss about the same problem. To a striking degree, the subjects likely to surface Tuesday — high drug prices and profits, limited price transparency, aggressive marketing, alleged patent abuse and mediocre "me too" drugs — are identical to the issues senators investigated decades ago, historical transcripts show. "Every decade since the Kefauver hearings has seen at least one set of congressional hearings into the increasing prices of prescription drugs," said Dr. Jeremy Greene, a drug-industry historian at Johns Hopkins University. "Drug prices, especially at the high end, are only ever higher" since the 1960s, said Dr. Scott Podolsky, a health care historian at Harvard Medical School. "The issues of transparency and profitability certainly have been there from the very first day of Kefauver." "While this country has the best drugs in the world, it would appear from the great number of letters which the subcommittee has received that many of our citizens are experiencing difficulty in being able to purchase them," Kefauver said in opening remarks. The sessions, which lasted off and on until September 1960, were "among the most sensational" hearings of that Congress, a syndicated columnist wrote at the time. Appearing were the bosses of Merck, Pfizer, Schering, Bristol-Myers, Upjohn, SmithKline and American Home Products. Senators dug into the prices of antibiotics, corticosteroids and tranquilizers, the wonder drugs of the time. John Connor, then Merck's president, said he had "deep sympathy" for people unable to afford medicine. So did Schering's boss, but he said it wasn't the industry's fault. "Undoubtedly some people find it difficult to pay for needed medication. They will also have difficulty in meeting their rent and food bills," said Francis Brown, Schering's president at the time. "It is a matter of inadequate income rather than excessive prices." "I still don't understand why druggists in London buy this drug for $7.53 and our drugstores have to pay $17.90," Kefauver told Connor, the Merck executive. "We meet different market conditions in different countries" was Connor's response. Americans were getting "a reasonable bargain," he said. "Merck's Head Defends Drug Prices" was the front-page headline the next day in the New York Times. "They were advised that whenever the senators mentioned high prices, just mention research and how difficult it is, how expensive it is," said Donald Light, a health policy professor at Rowan University in New Jersey. "Since 1959, that is the repeated and successful theme of Big Pharma." "The few successful products have to pay for the hundreds of research failures," Alvin Brush, president of American Home Products, told Kefauver's committee. "The consumer, in this field, cannot exercise his normal, economic prerogative of shopping or pricing before a purchase," the head of a generic-drug manufacturer told the committee. "The normal laws of supply and demand have no application here." Drug companies engaged in a "pharmaceutical numbers racket" by promoting different strengths of established drugs as new medicine and charging more, Louis Lasagna, a pharmacology professor from Johns Hopkins University, told the committee. "Now this is like saying that a dime is more potent than two nickels because you can use one coin instead of two," he said. Companies often worked not to develop breakthrough medicines but to take an existing product and "modify the original drug just enough to get a patentable alternative," said Dr. Frederick Meyers, a pharmacology professor at what later became the University of California, San Francisco. Maybe if the companies spent less on ads, armies of salesmen and "expensive stock options" for executives, Kefauver suggested, "you could lower the price of drugs too." Kefauver's draft bill would have withheld patents for modified drugs unless the new molecule gave a therapeutic response "significantly greater" than the original. It would have promoted competition by allowing anybody to license and sell a patented drug, in return for royalties paid to the patent holder, after three years. There was no need to limit drug prices, Austin Smith, president of the Pharmaceutical Manufacturers Association, told the Kefauver committee. Attempts to prove excessive industry profits were "doomed to failure," he said. Drug prices were rising more slowly than consumer prices generally, Smith said. Smith's counterpart today is Stephen Ubl, who runs what is now known as the Pharmaceutical Research and Manufacturers of America, or PhRMA. He takes a similar line, one that is likely to be repeated on Tuesday. "Drug prices are rapidly decelerating," Ubl tweeted last month.